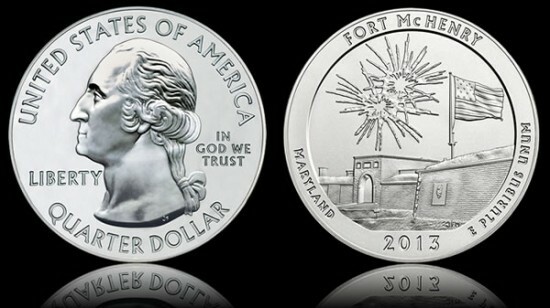 Sales kicked off strong for the 2013 Fort McHenry National Monument and Historic Shrine 5 Ounce Silver Bullion Coin. Released Monday, August 26, this coin minted for investors is the fourth of the year and the 19th overall in the series of America the Beautiful 5 Ounce Silver Bullion Coins from the United States Mint. The first silver coin issued this year, depicting White Mountain National Forest in New Hampshire, started at 8,900. Its sales are now at 31,100 coins. The second release, depicting Perry’s Victory and International Peace Memorial in Ohio, debuted at 8,000. Its sales are at 23,500 coins. Finally, the third silver coin, commemorating Great Basin National Park in Nevada, opened at 9,900. Its sales are now at 21,900 coins. Available this Thursday at noon ET is the uncirculated version for collectors, the 2013 Fort McHenry National Monument and Historic Shrine 5 Ounce Silver Uncirculated Coin. As a collector coin, it will be available directly from the United States Mint for $154.95. The bullion coin released on Monday, however, must be purchased by consumers from the secondary market. It usually takes a week or two for coin dealers and precious metals sellers to fulfill orders for a new 5 ounce release. Prices for the silver coins are usually a few percentage points above their melt value, which is five times the current spot price of silver. All five ounce coins are struck at the United States Mint facility in Philadelphia. The bullion coins have a brilliant finish while the uncirculated coin has a satin finish and also has "P" mint mark. Release details about the uncirculated silver coin will be published on this site later this week.